The inclusion of First Nations, Métis and Inuit perspectives, experiences and content is also supported by the Ministerial Order on Student Learning and the Government of Alberta’s 2014 statement on the Truth and Reconciliation Commission. Provincial Kindergarten to Grade 12 curriculum will include enhanced mandatory content for all Alberta students on the significance of residential schools and treaties. It is with this open-mindedness and open-heartedness to learn about the greater needs in the community that engaged thinkers and ethical citizens lead, create, innovate and continue to be stewards for Mother Earth and all their relations as their entrepreneurial spirit continues to grow. An engaged thinker and ethical citizen ensures the needs of all are met by helping others in a manner that preserves identity and contributes to transform society for all the generations to come. Who Is an Engaged Thinker? Engaged thinkers use both verbal and non-verbal acts of communication and listen, watch, sense and reflect on relationships. These relationships include the physical and spiritual; the natural and human forms; and the links between places, persons and time. Engaged thinkers identify, acknowledge and devise uses for the gifts of the Creator in a respectful manner for the benefit of all. Who Is An Ethical Citizen? Ethical citizens use their whole being to learn and to communicate in order to examine and understand all relationships and puts the group’s needs ahead of individual wants and desires. Ethical citizens place emphasis on the right questions and not the right answers. The knowledge, experiences, beliefs, values, protocols and worldviews of others are welcomed and appreciated as ethical citizens come to know more about themselves and one’s place in the world. The traditional teachings and values that the Creator’s gifts are for all and that all things must be respected and shared in an equitable manner are acknowledged and valued by ethical citizens. Who Is One With an Entrepreneurial Spirit? Students with an entrepreneurial spirit ensure that present and future generations continue to enjoy a good life based on being compassionate and supportive of family and community. Context and use of language are key elements to consider. Curriculum may contain a range of pedagogical approaches. Verna St. Denis speaks of the importance of using humour in Aboriginal teachings and communities in A Study of Aboriginal Teachers’ Professional Knowledge and Experience in Canadian Schools. Indigenous Pedagogy: Storytelling as a Foundation to Literacy Development for Aboriginal Children provides strong justification for the inclusion of storytelling as an authentic and appropriate method of inclusion of First Nations, Métis, Inuit, Aboriginal and Indigenous perspectives, experiences, histories, communities or stories. Why Is the Resource Named Guiding Voices? The title Guiding Voices reflects the view that laws of relationships are important to Aboriginal culture. Relationships with the natural world, with one another and with oneself are Aboriginal perspectives that govern behaviour. The title also reflects the relationship that Elders have as knowledge keepers in the oral tradition of Aboriginal cultures. The Elders’ guiding wisdom and voices provide direction and validation to those who seek their experience and teachings. Listening requires active participation. One who listens demonstrates humility and shows respect for the message that the Elders bring. The Elders, in turn, recognize their need for an audience. The Elders have a responsibility to be true to the message they give, and they also recognize they hold authority that can influence others. As the title suggests, there is a connectedness between the speaker and the listener. The acts of speaking and listening involve mutual thinking. Learning is not just a transfer of information between the speaker and the listener. For First Nations, Métis and Inuit, sharing information involves emotions and is a mutual relationship of personal interactions. Ideally, the sharing of information becomes a spiritual experience. Guiding Voices invites us to understand past and present issues and to take an active role in the healing process. Guiding Voices reminds us that we all walk in the footsteps of our ancestors. As we move forward in this world that is our life, we gain understanding and we embrace the principles of fairness and equity in all our relationships. The transfer of traditional knowledge from the old to the young, evident in Guiding Voices, renews the sacred circle of life. Although the title speaks to all of society, its approach to curriculum is particularly oriented to today’s youth, who are ultimately entrusted to model respect for people and for the gifts of the Creator. The spirit of the title Guiding Voices evokes the sacred responsibility held by Indigenous people and the call to all peoples to be caretakers of Mother Earth, ensuring that each generation is responsible for the seventh generation’s well-being. The principles of collective ownership, sharing knowledge and mutual respect are needed in today’s world. By listening to the voices of Indigenous peoples, all people can learn how to restore balance between the different elements of life and to practise being stewards to all. Guiding Voices is in the plural form in order to reflect the diversity of experiences, understandings and perspectives available to those who listen. These Guiding Voices can be human voices, oral, musical or visual, but they can also be the myriad of voices that Indigenous peoples and those who listen have always heard in nature—the voices of animals, of flowing water, of the wind and of thunder. In this respect, diversity is also implied when one considers that voices vary in volume. Some voices can be soft, and the listener must make an effort to hear the message. But the voices always guide and instruct. These voices teach the listener about values and lead the listener to truth, to knowledge of his or her identity, and of the listener’s place in the world. Why Is a Drum Used as a Symbol for Guiding Voices? 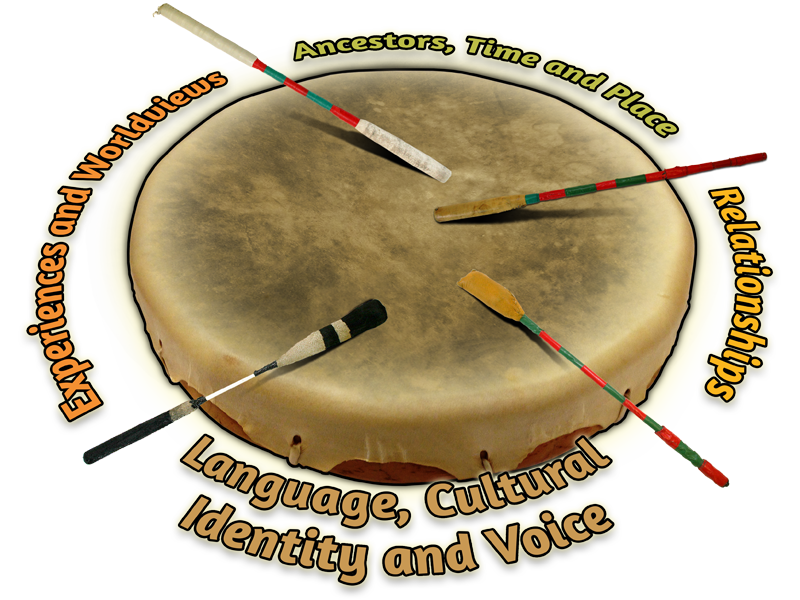 The image of the drum is used as a visual metaphor of unity within diversity and of many voices across time and space sharing a single message, a holistic message of collaboration, respect and growth for all. The drumbeat is often referred to as the heartbeat of all creation and the Creator. The drums used by many First Nations people at ceremonies and dances all speak with a similar voice—a heartbeat. The drumbeat is a reawakening of self and community, a call to the beginning of ceremony and new beginnings and an auditory acknowledgement of protocol and sacredness. The drumbeat reawakens a connection between past, present and future; between Knowledge Keeper and knowledge seeker; between speaker and listener; and with one’s emotional, physical, intellectual and spiritual being. Language, cultural identity and voice are elements of self-identity. Self-identity includes a sense of belonging and the roles of women, men and children. The curriculum includes the beliefs, traditions, contributions and practices of First Nations, Métis and Inuit with contextually appropriate language, cultural identity and voice. The Creator had created this universe and everything and that universe relates to us. We don’t relate to it, they relate to us. And as we are on this Earth we are related to everything that’s in creation. The trees, everything, the grass, the rock, everything. It’s part of the Earth. Just like we are. The Earth provides for us, today we call her Mother Earth. She provides everything for us and we lived off of that. If you could say that the culture is a tree, you know, for a while it got very sick because the roots were being hacked at and the leaves were being ripped off. But now, it’s being cared for and nurtured and it’s growing strong again and it’s growing in new directions. The roots and trunk are still the same, but the way it’s branching out, no one can tell: it’s unexpected and exciting. And that’s what the youth of today are doing. First Nations, Métis, Inuit and Indigenous ways of knowing reflect traditional knowledge and teachings and holistic learning, with the learning process, observation and practice being as important as what is being learned. My responsibility is to teach my children, my grandchildren, who they are. On my 85th birthday, I want my grandchildren to be able to say, “My Kokum told me about the ceremonies. My Kokum taught me the language. My Kokum differentiated our worldview.” And validate it. Nehiyawak kîyânaw (We are Cree). Language and terminology reflects respect for the diversity of First Nations, Métis and Inuit in appropriate contexts. Names of First Nations, Métis, Inuit, Aboriginal and Indigenous peoples are used with respect and not labelled in an inauthentic manner, such as using language that is generic (e.g., Aboriginal, Native) or denigrating (e.g., Indian, Eskimo, half-breed, mixed blood, squaw, buck). Respect for the significance of naming and earning a name is evident (e.g., traditional names, role names, ceremonial names, nicknames). First-person voice is acknowledged when individuals who share their personal experiences, beliefs, values and traditions are credited by name and affiliation. Credit is given to First Nations, Métis, Inuit, Aboriginal and Indigenous individuals and groups who share teachings of personal experiences, beliefs, values and traditions and not referred to anonymously or in an inauthentic manner (e.g., including a person’s or a community’s story and name without consultation). Traditional and contemporary Indigenous knowledge and technologies are respected and acknowledged. Ways of living—such as trade and commerce, clothing and lodging—are appropriately identified and historically accurate. For more information, see the Wilton Goodstriker interview that appears in the Traditional Environmental Knowledge section of Walking Together: First Nations, Métis and Inuit Perspectives in Curriculum. Reflect upon how language, cultural identity and voice are addressed in the component of curriculum under consideration. Experiences and worldviews of Indigenous peoples demonstrate a holistic perspective of the world. The curriculum includes the experiences and worldviews of First Nations, Métis and Inuit in appropriate contexts. Culture comprises a society’s philosophy about the nature of reality, the values that flow from this philosophy, and the social customs that embody these values. Any individual within a culture is going to have his or her own personal interpretation of the collective cultural code; however, the individual’s worldview has its roots in the culture—that is, in the society’s shared philosophy, values, and customs. If we are to understand why Aboriginal and European worldviews clash, we need to understand how the philosophy, values, and customs of Aboriginal cultures differ from those of Eurocentric cultures. Cultural authenticity is reflected by accurately presenting values and belief systems of individuals and groups in contemporary and historical contexts. Representations portraying First Nations, Métis, Inuit, Aboriginal and Indigenous people as wards of the state or in romanticized images, such as noble savages or Indian princesses, are not authentic, accurate or appropriate portrayals. First Nations, Métis, Inuit, Aboriginal and Indigenous people and communities are presented as independent, distinct, sustainable and self-sufficient. The meanings and significance of diverse cultural and sacred items are accurately and contextually presented (e.g., eagle feather, tobacco). Sacred rituals and ceremonies (e.g., sun dance, sweat lodge, night lodge) and protocols are treated respectfully and only shared where and when contextually appropriate. Sacred stories are shared with respect and in appropriate context following protocol. For more information on cultural authenticity and weaving of First Nations, Métis and Inuit perspectives, experiences and content, see the online digital resource Walking Together: First Nations, Métis and Inuit Perspectives in Curriculum. 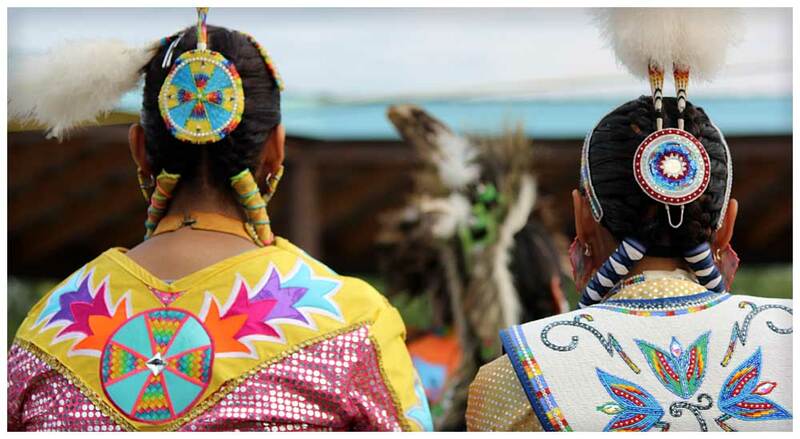 For more information regarding cultural authenticity and Aboriginal worldviews, see the video A Cree Perspective on Worldviews that appears in the FNMI Worldviews section of Walking Together: First Nations, Métis and Inuit Perspectives in Curriculum. Diverse perspectives of the impacts of historical events are presented. Indigenous pedagogy and ways of knowing are respected and appropriately reflected in contemporary contexts. There is accurate and authentic representation of First Peoples’ histories prior to the arrival of the Europeans. Information about treaties is reflective of the spirit and intent of treaties as well as their sacred nature. Histories, perspectives and actions are authentically presented and examined indicating how these have led to opportunities, challenges, conflicts and agreements. The historical and contemporary contributions of First Nations, Métis, Inuit, Aboriginal and Indigenous peoples to Alberta, to Canada and to the rest of the world are authentically and contextually presented with respectful acknowledgement. A diversity of leaders, role models, communities and places is presented. The roles of kinship, clans and traditional societies are accurately presented. For more information regarding perspectives of histories in the oral traditions, view the interview with Marge Friedel in the Oral Tradition section of Walking Together: First Nations, Métis and Inuit Perspectives in Curriculum. The involvement of appropriate Elders, Knowledge Keepers, storytellers, ceremonialists, cultural experts and recognized members of First Nations, Métis and Inuit communities in the development and validation of the curriculum is evident through accreditation and documentation. Stories, ceremonies, teachings, values and protocols are presented respectfully, authentically and appropriately to reflect a diversity of truths and perspectives. For more information, see the interview with John Janvier in the Oral Tradition section of Walking Together: First Nations, Métis and Inuit Perspectives in Curriculum. Reflect upon how ancestors, time and place are addressed in the component of curriculum under consideration. Guiding Voices is a tool that contains a vision statement and four guidelines with supporting criteria to ensure that First Nations, Métis and Inuit content is authentically included in Alberta’s curriculum. Guiding Voices is based on the foundations of the Aboriginal Content Validation: Guidelines for Evaluating Learning Resources for and about Aboriginal People (ACV). ACV guidelines were originally developed in conjunction with Alberta Education’s 1987 Policy Statement on Native Education in Alberta. Move forward with a revised design to be more representative of a holistic worldview. Review the language and presentation of ideas to ensure that terms are being included accurately, especially the terms First Nations; Métis; Inuit; First Nations, Métis and Inuit; Aboriginal; and Indigenous. Create one main focus statement to guide the intent for review or development of curriculum. Include definitions and understandings from appropriate sources for key terms and concepts to help curriculum developers, reviewers and educators consistently apply how terminology is used in curriculum. Develop fewer and more specific criteria to support the vision statement to ensure that curriculum contains accurate and authentic understandings of First Nations, Métis, Inuit, Aboriginal and Indigenous peoples. Include an updated reference list at the end of the guidelines. 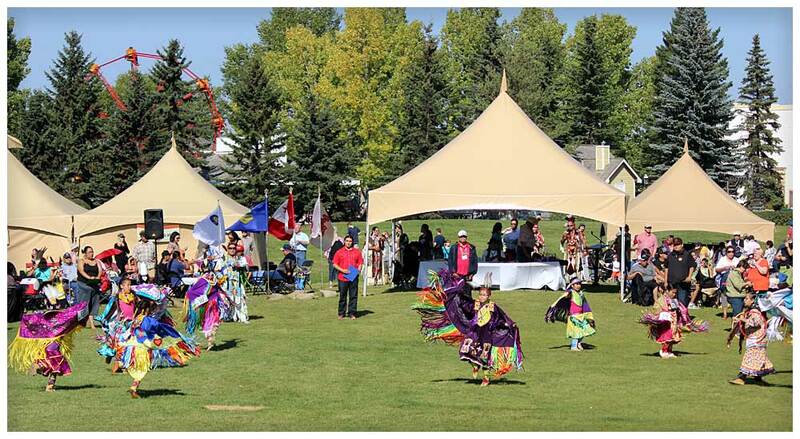 Include connections to examples in the Alberta Education First Nations, Métis and Inuit Curriculum Handbook: Oral Traditions Past, Present and Future (2006 Draft), which is now titled Walking Together: First Nations, Métis and Inuit Perspectives in Curriculum. Between 2005 and 2011, the digital resource Walking Together: First Nations, Métis and Inuit Perspectives in Curriculum was completed. The Common Tool was designed for use in a Western Canadian context. The 2005–06 recommended revisions to the ACV guidelines and elements of the Common Tool were reviewed and discussed in 2012 to reflect and respect the Alberta context and First Nations, Métis and Inuit voices from Alberta communities. This review and discussion led to the creation of Guiding Voices. The creation of Guiding Voices occurred in conjunction with Alberta Education’s ongoing Curriculum Redesign review of provincial standards and guidelines for curriculum development. Guiding Voices supports Curriculum Redesign initiatives; educators and developers; and provincial standards and guidelines for curriculum development, including First Nations, Métis and Inuit perspectives in programs of study, assessments, and learning and teaching resources. The review of provincial standards and guidelines for curriculum development and creation of Guiding Voices support community dialogue from Alberta Education’s Inspiring Education initiative and from Curriculum Redesign events, such as the Curriculum Roundtables. The 2011 Action on Curriculum: Research Roundtable 2 Report provided additional key foundations for Guiding Voices from Alberta Education’s Program Standards and Assessment First Nations, Métis and Inuit Advisory Committee. The current committee includes members of the original 2005–06 advisory committee. Guiding Voices reflects Alberta Education’s February 2002 First Nations, Métis and Inuit Education Policy Framework. These documents provide guidance for the evaluation and development of curriculum. This guidance includes involvement of collaborative partnerships, culturally responsive educational practices, capacity building, and emphasis on approaches that support student growth, pride and success for all learners. Feedback from various stakeholders indicated that there are important relationships between Guiding Voices and RDPR, notably with Sections 1b, 2 and 4. The criteria in Guiding Voices also recognize the role of competencies, literacy, numeracy and inclusion in curriculum development. The Framework for Student Learning: Competencies for Engaged Thinkers and Ethical Citizens with an Entrepreneurial Spirit; Literacy First: A Plan for Action; Numeracy: A Discussion Paper Draft; and Diversity in Alberta Schools: The Journey to Inclusion all play an important role in providing context for Guiding Voices. The following resources express a diversity of perspectives and viewpoints that encourage exploration and discussion of the multiple issues surrounding First Nations, Métis and Inuit education; the weaving of First Nations, Métis and Inuit content and perspectives regarding historical; and contemporary issues involving First Nations, Métis and Inuit. Bullchild, Percy. 1985. The Sun Came Down: The History of the World as my Blackfeet Elders Told it. Nebraska: University of Nebraska Press. Dewar, Elaine. 2011. Bones: Discovering the First Americans. Canada: Random House. King, Thomas. 2012. The Inconvenient Indian: A Curious Account of Native People in North America. Canada: Double Day. Milloy, John. 1999. A National Crime: The Canadian Government and the Residential School System, 1879 to 1986. Winnipeg: University of Manitoba Press. The Guiding Voices Evaluation Tool has been created to help guide development and evaluation of provincial and locally developed curriculum. This tool can be used to assist curriculum developers and evaluators determine the appropriateness of various resources for use in curriculum (programs of study, assessments and learning and teaching resources). The Guiding Voices Development Tool was also created to assist curriculum and resource developers. This tool provides a detailed list of the criteria curriculum developers should use to determine the appropriateness of curriculum and resources.